ROYAL DUCAL SANDWICH TRAY. ~ASIATIC PHEASANTS~. In a good used condition, small chip on the under side - see photo. MAKE :CROWN DUCAL : ORANGE TREE BUY NOW PRICE Each: £59.99. All sizes listed are approximate and as a guide only. MAKE :CROWN DUCAL : ORANGE TREE LLADRO & NAO. CONDITION OF. All sizes listed are approximate and as a guide only. The base has the makers mark. I think this is a second as it has a recessed dot through the makers mark. Excellent condition, no chips, cracks or crazing and colours still very good. Some rubbing to the gold edging and some minor marks from use. All have drill marks to the makers mark which normally means they are second but it is not clear why. More of this service on my other listings I will combine postage where practical. Please ask for price before paying Postage to UK buyers only due to the nature of the item. I will not post this item to shipping company addresses. Postcodes IM, HS & ZE incure an additional £2.30 postage charge. No. 796148. Crown Ducal. 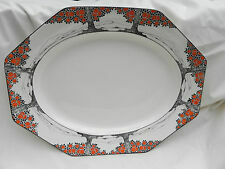 The oval plate is approx 12"x9"(30cmx22.5cm) and is decorated in an ivy design. ADAPTATION OF. EARLY ENGLISH. 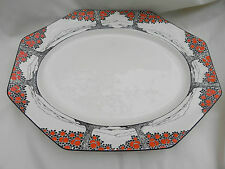 DUCAL WARE - VINTAGE WILMSLOW PATTERN Platters. These Are The Last. Beautiful Vintage Crown Ducal Wilmslow Platters. Selling the last few bits that I have. Good condition - no chips. Any questions, please ask. Sixe approx 410mm long x 330mm wide. 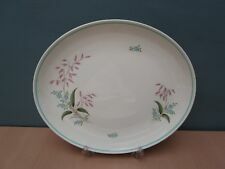 An Art Deco Crown Ducal Large Serving Plate / Platter. I would suggest that this may date to circa the 1920s / 1930s. Crown Ducal. Crazing to platter. "Water Lily". Two very large crown ducal oval platters. Duck egg blue wide border with gilt trims and hand tinted strawberry plant centre. Mark of the period, synonymous with Crown Ducal Pottery. If the item is new or in new. Selling the last of my Wilmslow Beautiful Vintage Crown Ducal Wilmslow platter. Large heavy platter. 17.5” by 13” Good condition Any questions, please ask. Ducal Crown Ware. Great usable condition. Antique crown ducal LARGE OVAL PLATE. A pale cream colour that graduates into lovely peach tones at top and bottom, with hand tinted decorations of flowers, birds around. Crown Ducal. "Water Lily". Crazing to plate. Crown Ducal Concorde earthen ware Brown Meat Platter. ART DECO CROWN DUCAL IRONSTONE CHINA SANDWICH TRAY/SERVING PLATTER IN CREAM, HAND DECORATED WITH RED AND YELLOW FLOWERS. Crown Ducal. Art Deco Ironstone China. MATERIAL: Staffordshire Ironstone China. A chip on the bottom. VERY COLLECTABLE AND RARE IN THE UK. ART DECO CROWN DUCAL BONE CHINA SANDWICH TRAY/SERVING PLATTER IN CREAM AND WHITE, HAND DECORATED WITH RED AND GREEN FLOWERS. Crown Ducal. Sandwich Tray, Serving Platter, Eared. Art Deco Bone China. Stunning item from Crown Ducal. Large Hexagonal Platter: 24.8cm across the flats. Two crazing lines to centre of plate. Rest of World £70. Object Type Platter. UPC Does not apply. Very nice Crown Ducal serving platter. It features the Charm pattern #7496 which is multi floral along the rim and center. There is a floral embossed design around the scalloped rim. It has the Crown Ducal Gainsborough England backstamp. 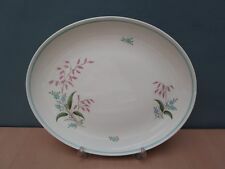 Crown Ducal Ware Platter England #1424 Bird Orange Blue 13"
THERE IS A SMALL FLEA BITE CHIP TO THE UNDERSIDE RIM.